Rehearsals began in December for a very special performance of the musical ‘The Secret Garden’ based on the novel by Frances Hodgson Burnett. This adaptation uses the inner conflicts of its adult characters as a backdrop to the ‘miracle’ experienced by the children. 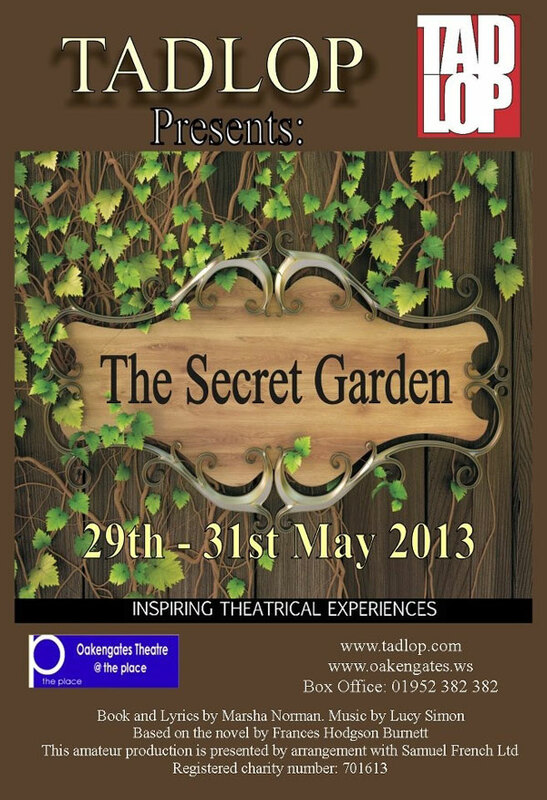 The Secret Garden follows 11 year old Mary Lennox as she deals with the death of everyone she has ever known. Mary is uprooted from India to Yorkshire to live with her Uncle Archibald whom she has never met. Her own personality blossoms as she with the help of a young gardener brings new life to her dead Aunt’s neglected garden, as well as to her sickly cousin and uncle. The original Broadway production was nominated for seven Tony Awards, three of which it won. TADLOP have been pleased to welcome some 20 new members to the cast plus a very special group of around 15 of our local, very talented children who are providing the enthusiasm and life to such a well known story. TADLOP are very much looking forward to presenting the classic tale with an imaginative twist. Here’s the flyer. Print some out and hand them around whydontcha?